Three men are to swim 21 miles from an Outer Hebridean island at the centre of one of the world’s greatest mysteries. The trio are to attempt to swim from the Flannan Isles to Uig on the west coast of the Isle of Lewis – each representing a lighthouse keeper who mysteriously disappeared from Eilean Mor – the main island of the Flannans – more than 100 years ago. 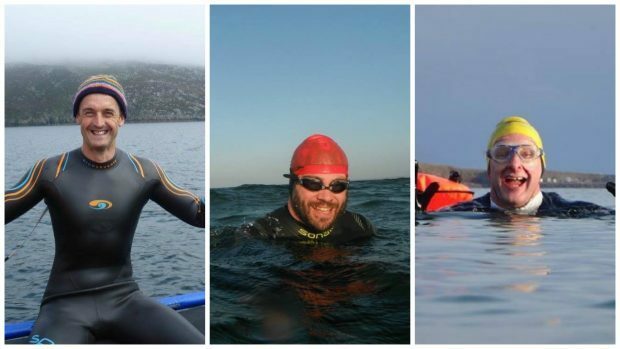 In the summer, charity open-water swimmers Colin S Macleod, Ed Smith and Stuart Baird, all from Lewis, will attempt The Flannan Isles Mystery Swim. The team will swim in relay formation, in 45 minute legs. Team captain Mr Macleod said: “The thing about swimming in the ocean is that you don’t know what’s out there. We’re happy to put our lives on the line to raise money for the RNLI as they do it all the time. Mr Smith added: “We often camp at Mealista in Uig and seeing the light flash on Eilean Mor sparked the idea for the swim. Built in 1899, the Stevenson designed Flannan Isles Lighthouse was manned by Keepers Thomas Marshall, James Ducat and William MacArthur.